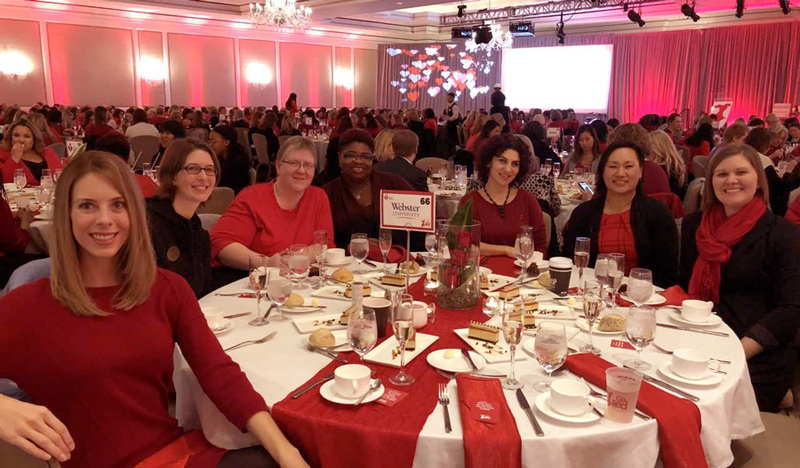 Representing Webster University at the Go Red for Women luncheon were attendees Samantha Sipple, Katie Knetzer, Theresa Altmann, Kim Jackson, Hasmik Chakaryan, Jennifer Andonoff and Jennifer McQuay. Webster Wellness thanks all who participated in the Go Red for Women campaign supporting heart health and fighting heart disease in women, which the American Heart Association (AHA) calls the “silent killer.” Webster participants donated $380 to the American Heart Association. Corinne Hilbert, Advancement, won the raffle and will get a wellness gift valued at $20. Webster University also sponsored a table at the Go Red event on Feb. 1 in St. Louis. We encourage you to continue to pursue healthy habits in nutrition, fitness and lifestyle that will contribute to your own heart health.